Dipped glove popularity has increased due to their comfortable design that still protects users from workplace hazards. The 1650 urinal floor mat provides an upscale appearance for high-end venues. These mats have a unique non-slip backing that holds them in place but doesn’t use a paper or Velcro backing which allows for easy installation. A non-woven fiber surface allows it to be mopped over and is also quick drying. Slips, trips and falls make up 30% of all workplace injuries. Thanks to the eye-catching design, and psychological cue of the banana peel's association with slips the Banana Cone is scientifically proven to be 12 times more effective than standard folding signs! Impact has a wide assortment of microfiber dust mops, wet mops and finish mops. Microfiber is highly absorbent, great for all purpose cleaning and removes more bacteria than traditional cleaning products. Impact has a wide assortment of both microfiber cloths and dusters. Microfiber is highly absorbent, great for all purpose cleaning and removes more bacteria than traditional cleaning products. Impact offers a wide variety of utility pails, buckets and accessories. Whether you are looking for a 6 Qt. PuraPail™ or a 10 Oz. dispensing pump, we make it easy for you to find the right tool for the job. PuraPails™ are constructed from high density polypropylene and have metal handles making them extremely durable. Available in 3 and 6 Qt. sizes, PuraPails™ meet HACCP dedicated use guidelines, and are also color coded to reduce the risk of cross-contamination and can be private branded with your company’s logo. We have a wide selection of containers, recycling options, waste baskets, thin bins and accessories. Our containers are available in many colors and sizes and offer good durability and excellent value. This makes it easy for you to get exactly what you need. Eclipse™ urinal screens and fragrance clips are the next generation in premium odor control. Urinal screens and clips are available in multiple scents and provide 30 days of high intensity fragrance for effective odor control in virtually any environment. The 8Y wringer and bucket combo has tons of great features. An extra long wringer handle generates greater pressure to the mop head, while a wave arresting water diffuser reduces spills. The 8Y also has integrated hold-areas for a wet floor sign, mop handle and putty knife. From the presentation to efficient table turns; our core line of food service products serve up a positive guest experience while making your job easier, safer and better. The cleanliness of a room directly affects whether customers will return, don't lose customers to dirt and grime! Make sure your team is functioning at its best with our hotel room core cleaning guide and our broad selection of cleaning supplies and products. GenAire™ metered aerosols bring the outside in! Fragrances contain no CFC’s, HCFC’s or other ozone depleters and meet California VOC regulations. From spicy to breezy, you will find a scent to suit your needs! No matter what your floor care cleaning needs may be, make sure your team is functioning at its best with our broad line of bucket and wringer combos! With so many options available we make it easy for you to pick the bucket and wringer that’s perfect for your team. Naturelle® by Impact. The Right Choice. Period. Our Naturelle® feminine hygiene products, vending equipment, and Sanisac® receptacles are a great choice for all your feminine care needs. This helpful guide walks you through the steps to restock our sanitary napkin and tampon dispensers. Our vendors come with a 25-cent coin mechanism. However, customers can also choose between 50-cent or “free” vending options for each product. This helpful guide walks you through the steps to change the coin mechanism of your feminine care dispenser. Many customers believe that a poorly maintained restroom indicates poor management. 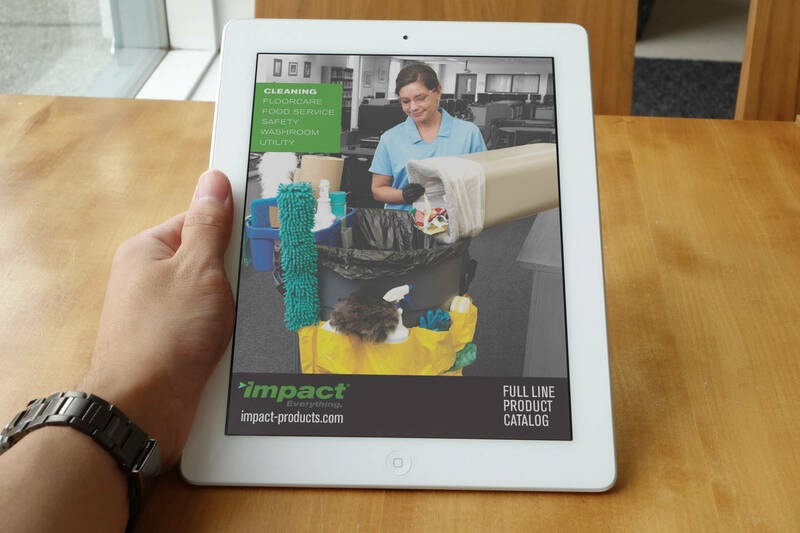 Make sure you create a positive guest experience with Impacts line of disposable toilet seat covers. The Mopster is a complete bucketless mopping system that includes a 16" frame, 32 Oz. bottle, disposable microfiber pad, and 54" handle. Swap-n-go modularity allows for easy switch-outs of dispensing bottles, labels, frames, and heads. This makes the Mopster a great choice for all your floor care needs. Find detailed information on all of the products that we manufacture in our easy-to-use digital catalog.